Are you concerned about possible Carbon Monoxide being present in your home or environment? Below is a list that will help you stay safe. Too often we get calls to our environmental consultants and hear misunderstandings about carbon monoxide (CO). Here are some carbon monoxide facts and common myths broken down. I can smell carbon monoxide when the furnace is on. CO is actually colorless, tasteless, AND odorless. 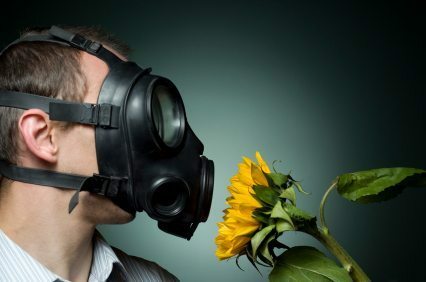 Because it cannot be noticed without a detector or meter, CO has earned the dubious name of “silent killer.” When folks call and say they can “smell carbon monoxide,” they are usually referring to other combustion byproducts that the human nose can detect. If you can smell combustion byproducts there is a problem that should be addressed ASAP. Carbon monoxide is heavier than air, so CO detectors should not be placed on the ceiling or high on the wall. CO is slightly lighter than air. However, studies have shown no significant difference in measurements based on what height CO detectors are mounted. Different manufacturers recommend different mounting locations, and you should always follow the manufacturers’ recommendation. CO has a molar mass of 28.0, and air has an average molar mass of 28.8. The difference is so slight that CO is found to evenly distribute itself indoors. It is worth mentioning that CO indoors is usually generated from incomplete combustion (heat source) and therefore traveling in a warm air stream. Warm air is more buoyant and does rise. Coupling this fact with the knowledge that CO is lighter than air… I personally have my CO detector located on the ceilings. Placing the alarm in a high area of the home, where smoke and hot air would collect during a fire, seems like the most logical advice for me. I have heard that air can stagnate in some corners, so it’s advised not to install a smoke or CO alarm within 16″ of the side wall or ceiling. In other words, if you’re going to install it in a hallway, put it in the center of the hallway ceiling – not too close to a side wall. First Alert CO605 Carbon Monoxide Plug-In Alarm with Battery Backup. Council (section R315.1) pretty much mirrors the above language. “For new construction, an approved carbon monoxide alarm shall be installed outside of each separate sleeping area in the immediate vicinity of the bedrooms in dwelling units within which fuel-fired appliances are installed and in dwelling units that have attached garages.” If there are no combustion appliances, then CO detectors are not required by this code. California Senate Bill 183 requires CO alarms for any dwelling unit with a fuel-burning appliance, fireplace or attached garage. This accounts for the vast majority of residential buildings in CA. Effective in 2011 all new and existing single-family construction must install CO alarms, and in 2013 all multi-family dwelling units were required to be outfitted with CO alarms. LEED-H requires CO alarms and offers points for outfitting garages with a minimum 100 cfm exhaust fan, per bay, in order to reduce the risk fo CO poisoning. The exhaust fan should run continuously (energy hog) or may be connected to the garage door opener, motion detector, or CO sensor. Carbon monoxide is not dangerous. CO poisoning is the most common type of fatal indoor air poisoning in countries where cooking and heating is still dominated by fires. More than 500 Americans die each year from unintentional carbon monoxide poisoning. Symptoms of mildly acute CO poisoning include lightheadedness, nausea headaches, fatigue, and flu-like symptoms. Acute CO poisoning leads to sleep and the failure of the central nervous system and heart – leading eventually to death during sleep. The following chart from Wiki summarizes known human symptoms associated with different levels of CO exposure. If we detect ANY CO indoors, we consider it an immediate action. Carbon monoxide poisoning is like any other kind of poisoning. CO bonds to hemoglobin (Hb), and instead of carrying oxygen (O2) the hemoglobin is then occupied with CO – creating carboxyhemoglobin (HbCO). CO poisoning is actually the result of the head and heart not receiving sufficient oxygen… or asphyxiation. If a person is removed from a high-CO environment after acute CO poisoning they may still suffer difficulty with some mental functioning such as short-term memory, dementia, amnesia, irritability, an unusual walking gait, speech impairments, and depression. I’ve spoken with people that said it’s taken them months to fully recover their mental functioning after an acute exposure event to carbon monoxide. Carbon monoxide detectors are in perfect working order if they beep when I push the test button. Gas sensors in CO alarms have a limited lifespan, generally less than 6 years. The test button on common CO alarms only tests the battery, not the CO gas sensor. It is recommended that CO gas sensors be periodically tested and calibrated by exposing them to a known amount of CO. Because CO alarms have come down so much in price, it’s generally cheaper to replace the alarms than have them calibrated. Change the batteries to your smoke and CO alarms at least once a year. If you cannot change the batteries yourself, consider subscribing to a home maintenance service such as Four Season Stewardship. Most CO alarms sold today in the US will not sound an alarm until concentrations greater than 50-70 parts per million (ppm) are reached. Many believe CO alarms should signal at far lower levels. In fact, the Building Biology guideline is that indoor CO should never exceed outdoor concentrations. Where we live, in the San Francisco Bay Area, it is rare to detect more than 1 ppm in outdoor air unless you are standing near an active flue or chimney. The most significant source of human-produced CO is formed during combustion when there is insufficient oxygen (O2) to produce carbon dioxide (CO2). Imagine where this scenario may take place… does a hot water closet come to mind? How about a furnace located in a crawlspace or attic? Or a poorly vented kitchen with a gas stove? Installing a CO alarm is a low-cost way of significantly reducing your risk of CO poisoning. Do it. It’s inexpensive and easy. Replace the batteries according to the manufacturer’s instructions, and replace units at least every 5 years. Carbon Monoxide facts should be well known to everyone. Hopefully, these tips will help you reduce the risk of CO poisoning. Testing for Carbon Monoxide is a standard part of our Healthy Building Inspections. Our contracting arm also offers a subscription home inspection and home maintenance program which includes changing batteries. Healthy Building Science is an environmental consulting firm which provides indoor air quality testing services for commercial, multi-family buildings, offices, industrial and manufacturing workplaces, hospitals and medical facilities, and single-family homes in the greater San Francisco Bay Area and all of Northern California. Carbon dioxide is an odorless gas. There are other combustion byproducts, that may be found with CO, which do have an odor. Get a CO alarm if you have any doubt. We are not doctors or medical experts, so I suggest you direct this question elsewhere. I do know that CO interferes with O2 in the body, so it results in asphyxiation at high levels. Not sure that CO lingers in the human body. Whatever the case, the CO from January 6th would be long gone by now. In the future you would be wise to follow the manufacturer recommendations. Installing a CO alarm in your garage may be annoying because it could go off when cars idyl, but it may give you more peace of mind. You might also consider placing a CO monitor just inside the home nearest the garage. Play safe, and whip that hubby into shape! As long as the combustion appliances are properly vented and there’s no backdrafting occurring, the number of gas-fired appliances operating shouldn’t make a difference to how much carbon monoxide is measured indoors. Do pay attention to the CO alarms and don’t hesitate to vacate the building if they keep going off. One possible scenario could be the dryer creating negative pressure in the home (and attic) and CO and other combustion byproducts could be being sucked into the attic via roof vents. Hi, what is the best way to test if you have CO in your body? I installed a new gravity, 35000 BTU wall heater yesterday and ran it for several hours. I attached it to the flue already in place. After about 5 hours I turned it off. About 3 hours later I was going to bed when my CO detector went off. Actually 2 alarmed. I also have an ac one that showed 51 (parts per million?) in it’s lcd. I realized that during one point in the day I had the furnace running, a wood burning stove going, a gas drier running and a gas oven on. Maybe the gas water heater was running too. It’s located in my attic. We opened some doors, I reset the plug-in CO detector and it read 54 but the two other detectors were not going off. I went to bed, closing my door and opening a window. No issues. Ideas? Maybe too many gas appliances running at the same time? You should ask your building official. There may be exceptions if indeed there are no gas-fired appliances, but having a CO alarm installed is a low cost protection measure in case someone brings in temporary heat or generators, etc. Ask your local code expert and if there remains any concern just get an off-the-shelf plug-in alarm for your own peace of mind. You should not have combustion gases, including carbon monoxide, in your heating ducts. To me that would indicate that there is a leak between the firebox and air ducts within your furnace. Fire and combustion exhausts should only be exhausted through a proper vent – usually straight up and out the roof. If combustion exhaust is somehow intermingling with your supply ducts there is a problem that needs fixing. My gas heater recently had routine maintenance and my technician indicated that the CO level being emitted from my heating vents was between 3-4 PPM. He said that I had nothing to worry about, that this was normal and it doesn’t have to be 0 in order to be safe. Is this typical? Also, when I turn the heat higher, should I be concerned about the CO levels rising? Humm… Not exactly sure about a CO point system. Perhaps it had a built in CO meter and it reads in parts per mission (PPM) and each “point” is a PPM? That would be my only guess. Always question the motive of the salesperson! What is the difference between a carbon monoxide “point” system on an old heater and the carbon monoxide ppm chart? My heating company said I have a 1 point reading on my heater, and that it should be zero. Are they just trying to sell me a new heater? It’s 26 years old. You can get a CO detector or alarm rather inexpensively, so if you have concerns I’d say buy the peace of mind. If it is car exhaust or combustion exhaust from a furnace or water heater, then there is a risk of carbon monoxide poisoning. Sorry for the odor. one room in my house by the front door smells like gas coming from a car with the ignition running. it smells like that outside my house also. do i have to worry that it may be CO? #1) Does Carbon Monoxide Come From The Ground? AS: Not that I’m aware of. Generally CO comes from combustion sources such as vehicles and gas-fired appliances such as water heaters, boilers, furnaces, ovens, etc. #2) Should Carbon Monoxide Be a Plug-In Type Mounted in an Electrical Outlet approximately 18″ Off of the Floor? AS: You should always check in with your local code official. I believe there is a movement away from plug-in versions because they are so easy to disable and remove. Since CO and ambient are are so near in weight, the location on the wall shouldn’t matter much. But ask your local code official to be certain your following your local rules and regulations. #3) Is it True That Smoke Detectors and Carbon Monoxide Detectors Should Be Kept Separate? AS: I have not heard this. What is the rationale? Most people want to minimize the number of units and blinking lights on their walls and ceilings, and that is why the combo units are so popular. I have not heard of performance problems with combo units compared to standalone smoke and CO alarms. Wow. That’s a heck of a CO story. You’re lucky. Unless you live above or around a unique chemical or manufacturing plant, CO would most likely have come from vehicle tailpipes or combustion appliances within the building. If you live over or by a parking garage it’s possible there was some pressurization condition that day that led to more vehicular exhaust entering your living space. Or maybe there was a car idling or a temporary generator placed near the building’s air intake. But most often it’s a combustion appliance (e.g., gas dryer, gas oven, gas furnace, gas water heater or boiler, etc.) that is backdrafting due to negative pressure indoors or leaking due to improper exhaust ventilation design and/or construction. Keep those batteries up to date! It is prudent for the owner of the building to find out what happened. You should have an indoor air quality inspection performed by an industrial hygienist. In general I would suggest more CO alarms, not less. So if you’re already going to install a smoke alarm why not make it a combination unit. If either alarm sounds you’ll know you have a fire or ventilation problem resulting in smoke or carbon monoxide in that space. That could be life-saving information under the wrong circumstances. You should ask your local code official, but in general it is suggested to install a smoke/CO alarm on each floor, in each bedroom, and in any hallway outside bedrooms. If you have any doubt, more is better. If the space is not very big and the rooms are not separated by partition walls you could probably consider a central area, but to be certain you should ask your local code official for guidance. I agree. Burning fuel in open containers indoors is not best practice for managing indoor air quality. Open a window or switch to electric heat if you can. Any open flame combustion should contribute to elevated carbon monoxide (CO) indoors, but there are hundreds of other chemicals released that will also impact IAQ. My CO went off in my condo earlier this week. Turns out one of the other units in my building had life threatening levels of CO and we had to pull them out (they’d been exposed to levels leading up to and eventually exceeding 1000 ppm for at least 1-2 hours). Now, the only reason we discovered it was because we dismissed the alarm as batteries. When leaving my unit I could smell what I thought was and assumed was gas, but different in our hallway. When I opened their unit same thing. The Fire dept didn’t smell it, other neighbors in the building didn’t smell it. My 3 daughters smelled it, I smelled it, and the lady who passed out had smelled it before she passed out and was investigating her stove burners. My husband couldn’t smell it, her husband couldn’t smell it before he passed out either. They originally told us it was probably a gas leak, but later determined there was no gas leak it was a CO leak (I don’t know what from, I’m still inquiring). What could we have been smelling that other people couldn’t smell? The only reason we evacuated was because of that smell? I have a bedroom in the basement with a water heater closet. I was going to put in a combination smoke/CO alarm in the bedroom. Do I need another combination unit in the basement where the furnace closet is in case the source of CO is coming from the furnace, or will a smoke alarm be fine? My downstairs is basically a circle of rooms mainly separated in the middle of the circle. Does this mean I need a carbon monoxide detector in each room for appropriate coverage or would the kitchen (at 12 o’clock) and the foyer (at 6 o’clock) be sufficient? Hi, I feel really sick when Sterno fuel is used to keep food warm in my office and would like to know what you think. Yes. I believe it would be better than nothing to plug a CO detector in at floor level. Follow the manufacturer recommendations. You should contact a local building professional or health inspector ASAP. In the meantime make sure your CO alarms have batteries and are operating as intended. Might keep the windows open in the short-term. I cannot tell from the description if you’ve increased your risk of CO poisoning or not, but better to play it safe since CO can be a silent killer. Wow. That’s an interesting air quality mystery. I do not believe that CO would be somehow trapped in the sofa and slowly off-gassing in sufficient quantities to trigger the CO alarm. Does there happen to be a combustion appliance below or nearby where you installed the CO detector and couch? The couch itself may have influenced air patterns, or, the CO alarm could be going off because it’s confused by some chemical in the couch. No. Unfortunately not. To my knowledge there isn’t a filter that will help in cases of high CO. Ventilation is the key. Good exhaust ventilation that doesn’t get backdrafted into the building, and sufficient outdoor air ventilation to ensure good indoor air. is there a filter i can put in my furnace to pick up CO ?? will a carbon filter work?? We just put 2 sofas in our house that had been in the neighbors garage for awhile. After sitting in my living room for about 24 hours the Carbon monoxide detector started beeping. it was in the wall socket right behind the sofa. It did not beep when placed in other places of the house. Can Carbon monoxide be collected in the fabric of the sofa from sitting in the garage? Can it be aired out and safe? I’m wondering if it is useful to have a carbon monoxide detector plugged in at floor level?